Novelist Jonathan Safran Foer once described his approach to the writing process as “trying to stop making sense, and create something that just has an effect”. It’s an intention that’s easy to track in his sophomore novel Extremely Loud and Incredibly Close, which uses an idiosyncratic mix of prose, pictures and blank pages to spin its two narrative strands. The first of these, following a nine-year-old boy grieving his father’s death in the 9/11 attacks, is intact here while the second is all but entirely excised. The course from stage to screen seldom did run smooth and cuts are inevitable, but this adaptation from director Stephen Daldry (The Reader, The Hours) is closer to an evisceration, stripping out everything that made Foer’s story wrenching and unique with nothing of value to offer in its place. A precocious, skittish “amateur inventor”, beset with fears of the everyday, tormented both by his grief and by a related secret he’s keeping, Oskar (Thomas Horn, pictured right) is the opposite of an everyman, an extraordinary child in extraordinary circumstances. His discovery of a key in his late father’s (Tom Hanks) wardrobe sets him on a journey through New York City’s five boroughs, systematically interviewing everybody named Black – the name written on the key’s enclosing envelope – in the hope one of them can offer him some answers and the chance to feel close to his father again. Much of what made Foer’s Oskar heartbreaking was the unfailingly matter-of-factness with which he presented his experiences. Whether describing an imaginary invention or a moment of unthinkable sadness, his prose was determinedly undemonstrative, which gave his rare moments of revelation all the more impact. Scriptwriter Eric Roth (The Curious Case of Benjamin Button) has translated many of Oskar’s offbeat musings wholesale into voiceover, but their breathy, over enunciated delivery here announces them from the outset as Emotionally Significant and therefore, inescapably, prevents them from actually being so. Voiceover aside, there’s no getting around the uncomfortable fact that Horn’s performance is one of the film’s biggest problems. Comparisons to Hugo – another Best Picture nominee centred on an isolated young boy’s efforts to discover the secret behind a mysterious key belonging to his recently deceased father – are inevitable, and next to Asa Butterfield’s emotionally nuanced turn Horn comes up decidedly short. It seems profoundly unfair to blame a child with no prior acting experience for failing to deliver, and thankfully in this case the blame can be apportioned equally to Daldry and Roth. They force Horn to play an Oskar who’s less an endearing, engaging protagonist than a nonsensical collection of tics, vacillating wildly from laconic edginess to hysterical shrieking fits (again, quite antithetical to Foer’s stoical creation) with little logic, with the question of Asperger’s referenced but never explored. 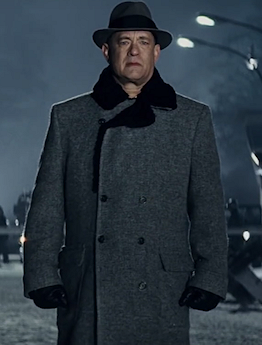 You’d think that if there’s one thing Hanks (pictured above) should be able to do, it’s play an affable, good-time-guy sort of dad. But he goes for a weirdly mannered, distancing turn that borders so much on clownish that the father-son dynamic (established via flashbacks) is tough to invest in. Sandra Bullock fares much better as Oskar’s mother, and in fact her final phone call with Hanks is one of the film’s few standout scenes, calculated though its impact feels. It’s ironically the film’s finest, most touching performance that also represents its most troubling diversion from the source. Without wishing to give too much away, Max Von Sydow’s character is an amalgamation of two from the book, and he’s also all that remains of its second narrative strand. To be fair to Roth, much of this strand – set many decades in the past and focusing on Oskar’s grandparents, who married after both survived the Dresden firebombing – is Foer at his most impressionistic, and heavy cuts were inevitable. But in losing both the Dresden element and a memorably horrifying portion centred on Hiroshima, Roth makes this purely “a 9/11 film” rather than a broader exploration of national trauma. This is delicate narrative surgery, and it’s performed here with the very bluntest of instruments. Oskar’s story was never intended to stand on its own, and while there’s no reason it shouldn’t work – certainly there’s more than enough intrigue and pathos in his search – Daldry’s ham-fisted direction ensures that it doesn’t. This is a muzzled beast of an epic, all its sharp, strange edges blunted, its askew angles righted. Those who haven’t read the book will at least be spared the knowledge of what they’re missing, but they’ll nonetheless be left with a bland, saccharine and thoroughly Hollywood “post-9/11 picture”, one of the Academy’s most inexplicable Best Picture nominees in years.